November | 2013 | This is Ashok. Paul Krugman and David Rosenberg vs. Larry Summers and Ian Bremmer. Paul, you forecast in 1994 […] that Japanese potential GDP growth would be 3% or a bit more. By that standard, Japan is now producing half of the potential output that people were forecasting when its lost decade began. That’s a problem of a different magnitude than a U.S. gap, serious though it is, at 6 or 7%. There is little wonder that Japan’s slow-down is so profound given the magnitude of the structural problems that hold Japan back: the most rapidly aging society in the industrialized world resulting in slow labour-force growth; epic insularity and inability to accept immigration; in the face of distress a massive retrenchment by its companies to their home markets; an utter lack of capacity for entrepreneurial innovation in the era of the social network. The United States remains, witness my colleague here, the only country in the world where you can raise your first 100 million dollars before you buy your first suit and tie. Let’s look at relative perspective. When Japan went wrong in the 1990s, the world was working. The United States was flourishing and growing. […] The United States’ problems are the problems of every industrial democracy. And the U.S. share of the industrial world is steadily increasing. [I]f you look at what passes for governance in Europe in recent years, I would suggest that our problems do not loom large relative to either the economics or to the politics in the rest of the world. We remain totally unlike Japan. We remain the place where everyone in the world wants to come and the place where everyone in the world wants to put their money. Finally, we are a uniquely resilient society and we have seen this before. John Kennedy died believing that Russia would surpass the United States by the early 1980s. Every issue of the Harvard Business Review in 1991 proclaimed that the Cold War was over and that Japan and Germany had won, and that was before the best decade in U.S. economic history. It will take time. There are steps that need to be taken but we are a society that works. We are a society whose principle problems — we all up here agree — can be addressed by a change in the printing of money and the creation of infrastructure. That is not the kind of fundamental problem Japan has. If we can in our public life, corporate life, and individual life turn our attention more to the future away from the present, this can be a profoundly important moment for the US. CF: Following on from your focus on growth, there is an argument that I hear more and more people taking seriously advanced maybe most boldly by Tyler Cowen that growth maybe innovation and productivity growth is over. The low hanging fruit has been picked and we’re in a stagnant period. Do you buy any of it? LS. Not a bit of it. Everyone in this room here was required to turn off their device in this room a couple of minutes ago. The device you were required to turn off had more power than the Apollo project, it has better access to information than the Library of Congress and in terms of reaching people around the planet, you would trade JFK’s communication system for your iPhone. And in 5 years from now 5 billion people will have it. So I don’t know how anyone can say we are making fundamental progress. The prophets of doom cannot have it both way. You cannot both say that the [robots are taking your jobs] and say nothing is happening that’s important for productivity growth. And in between those two if you want to have a dystopian idea, I think the must more fundamental idea is what technology is doing for the middle-skilled. I think that is a much more serious problem than the idea that somehow there is nothing new. One other thing, I see my friend Francis Collins sitting here and he knows infinitely more about this than I do. But perhaps the wisest aphorisms I learned in grad school was [Rudi] who told us that things take longer to happen than you think they will, and then they happen faster than you think they could. It was famously observed that the computers were everywhere but the productivity statistics. And then you saw what happened. [I think the same thing will happen with genomics]. Larry Summers believes deficits pose an important problem and hence negative interest rates are not yet on his radar. Larry Summers refuses to accept Paul Krugman’s comparison of the United States to Japan. Also, an odd choice of boots. If you go back and you study the economy prior to the crisis. There’s something a little bit odd. Many people believe monetary policy was too easy. Everybody agrees there was a vast amount of imprudent lending going on. Almost everyone agrees wealth as it was experienced by households was in excess of its reality. Too easy money, too much borrowing, too much wealth. Was there a boom? Growth was not high, unemployment was not too low, and inflation was quiescent. Somehow even a great bubble was not enough to create an excess in aggregate demand. Now think about after the crisis. You’d imagine that once things normalize you’d get more GDP than you would have had. Not that four years later you’d still be having substantially less. So there’s something odd about financial normalization if that was what the whole problem was and then continued slow growth. So what’s an explanation that would fit both of these observations? Suppose that the short term real interest rate that was consistent with full employment had fallen to negative 2 or negative 3 percent sometime in the middle of the last decade. Then what would happen? Even with artificial stimulus to demand coming from all this financial imprudence, you would not see any excess demand. And even with a relative resumption of normal credit conditions, you’d have a lot of difficulty getting back to full employment. Yes, it has been demonstrated that panics are terrible and that monetary policy can contain them when the interest rate is zero. It has been demonstrated less conclusively but presumptively that when short term interest rates are zero monetary policy can affect other asset prices to plausibly impact demand. 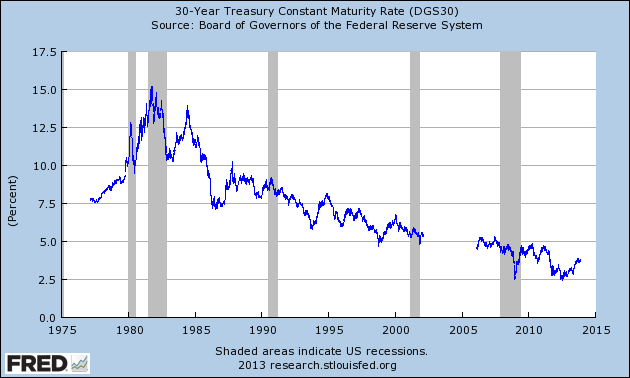 But imagine a situation where natural and equilibrium interest rates have fallen significantly below zero. Then conventional macroeconomic thinking leaves us in a very serious problem because we all seem to agree that whereas you can keep the FFR in a low rate forever, it is very hard to do extraordinary measures for ever beyond that. […] This may all be madness and I may not have this right at all, but it does seem to me four years after the successful combating of crisis with no evidence of growth that is restoring equilibrium one has to be concerned about a policy agenda that is doing less with monetary policy than has been done before that is doing less with fiscal policy than has been done before and is taking steps whose basic purpose is for there to be less lending, borrowing than before. So my lesson from this crisis which the world has under internalized is that it is not over until it is over and that is not right now and cannot be judged relative to the extent of financial panic. And, we may well need in the years ahead to think about how we manage an economy in which the zero nominal interest rate is a chronic and systemic inhibitor of economic activity holding our economies back holding us back from our potential. Note, I am not accusing Summers of hypocrisy in this case. Too few intellectuals – especially those of this prestige – change their mind. I’d be thrilled to hear Summers detail the revision of his priors. That is always an interesting process. I will add it does not seem to me – at least within the intellectual confines of a twenty minute video for Davos – that Summers really gets Tyler Cowen’s argument right. It is very easy to “have it both ways”, as Summers puts it. In fact, his latest at the IMF is provides precisely this reconciliation. Certainly Summers does not now believe that the iPhone will not reach the masses of Africa, that genomics will stop in its tracks, or that 3D printing will fail (any more than it would have in January of this year, at least). But suddenly that does not matter. In fact, that is precisely why this is interesting – everything Summers said in 2011 holds true and could still be argued today. It seems, given that the facts have not changed, that Summers is interpreting them through a different model. There is also the possibility that Larry Summers judged that the audience at the Fourteenth Jacques Polak Annual Research Conference at the International Monetary Fund in honor of Stan Fischer is a lot, lot more sophisticated than jet setters at the Munk Debate or Davos. But, if you don’t get the deficit under control you will eventually get a macroeconomic catastrophe. It is not that his underlying model of the world is wrong. Just that the parameters that were always true, that no one really thought about, don’t matter anymore. Cyclical demand shortfall (Larry Summers, Munk + Davos). Secular demand shortfall (Larry Summers today, Paul Krugman). Other structural factors. Or an amalgam of the above. Or something else. (Tyler Cowen). First of all, talking about “low demand” without reference to a given level of supply is stupid. Aggregate demand in Eurozone is really low right now. But if South India + Maharashtra (approximately the same population) had the same level of demand relative to their supply India would be, well, indescribable. I make this explicit because it is very important to distinguish between “demand” in Summers’ first two videos to that in his last. In the former two he is extolling America’s supply-side potentials. It is unclear to me the way he models supply with his new interpretation of the world. I am looking forward to reading many more posts on this hypothesis. I am glad others are thinking along the same lines. Hopefully central bankers consider a higher inflation target seriously. I’ve read a lot of posts recently claiming that the Fed should throw in the towel, because “US growth is not what it used to be”. That could be true. It’s very difficult to suss out structural changes, but it’s unreasonable to be puritanical that our problems can be solved with, and only with, more aggregate demand. At least if you define “solve” as returning to the 1990s boom. However, it’s a bit aggravating when people insist that this has anything to do with what the Fed should or should not be doing. The Fed’s not in the business of increasing productivity growth or managing real GDP. As far as I know, no model suggests that the economy is hitting its potential when inflation is unanchored well below its long-run trend. In fact, aggregate supply doesn’t even matter right now. When consumers are leveraged to the hilt a fall in prices from a productivity boom would just increase balance sheet constraints in the economy as the real-value of debt rises. “Easy money will likely lead to asset bubbles or higher inflation, because policy is miscalibrated relative to … the economy’s underlying potential,” said Joseph LaVorgna, chief U.S. economist at Deutsche Bank. It’s not clear to me what monetary policy has to do with asset bubbles. We should either not care about those or, preferably, outsource that to the macroprudential regulators. Asset prices shouldn’t be a cornerstone of any monetary policy (which, incidentally, is why we should be skeptical of the wealth effect from quantitative easing). But let’s go back to what Deutsche Bank is saying. Quantitative easing and zero interest rates will cause inflation because potential GDP isn’t what it was. However, this would require accelerating inflation as “artificial” demand competes for a shrinking stock of free labor. We’ve got precisely the opposite phenomenon. Either demand is not high or the growth potential of the US economy has surged (and while that’s good for the future, it doesn’t do squat for us today). As Piketty and Zucman thoroughly confirm, the wealth-to-income ratio increases as would be expected under conventional models. Any observer notices that this trend in interest rates is completely independent of monetary policy in the past few years. Growth has been slowing down which means much more wealth is chasing much less capital, resulting in a falling labor share, and low interest rates. It is a tautological position to suggest the Fed should change course because low growth will cause asset market bubbles and hyperinflation. However, with the long-run supply side costs of persistently low demand (hysteresis) it might just be self-fulfilling. Let’s hope it doesn’t get there. A fantastic new paper from Dave Reifschneider, William L. Wascher, David Wilcox – all economists at the Federal Reserve – tries to put some numbers on something economists have been worried about for a while: hysteresis, or the gradual contraction of labor supply due to deficient demand. (John Cassidy has a good rundown). The upshot is that hysteresis over the past five years may halve growth potential. This is (or at least should be) the most urgent, if not important, issue for policymakers. The standard story will tell you this is, keeping structural constraints constant, an irreversible trend. As price level increases with a higher aggregate demand, the cost of production rises contracting aggregate supply. This is almost certainly a fairy tale. Consider why workers exit the labor force. After a point, the monetary and psychological cost of searching for a job exceeds the expected benefit – ∫(chance of being hired at a given wage rate * wage rate) over all wage differentials. Assuming the costs remain constant, the best way to expand the labor force is to increase the opportunity cost of remaining outside: that is either increase the chance of being hired or the nominal wage rate. A naive analysis would suggest monetary policy can’t do much in the way of the former, and that the nominal above should be replaced with real. (To some extent, this would be correct, the best thing we can do right now is offer reemployment credits and a payroll tax holiday). Indeed, the opportunity cost of a certain wage rate shouldn’t really be measured in the dollars I could earn, but the purchasing power thereof. However, those who exit the labor force have some form of support system: savings, welfare, and help from friends among others. It would not be unreasonable to assume that except for the most basic needs (catastrophic healthcare, charity, and certain welfare programs) none of this support is, unlike the wage rate, inflation protected. The nominal wage rate is the price level * real wage rate. By definition, increasing the real wage rate increases the cost of remaining out of the labor force. But clearly increasing the price level does as well. There’s another, possibly deeper, reason: the money illusion (not the blog). People think in nominal terms. If you don’t believe this consider the fact that people across the world are simultaneously worried about both inflation and wage stagnation, even though my raise is your inflation. Increasing the nominal wage rate would give workers the perception that they are actually earning more in real terms. That’s all that matters as far as the decision to reenter the labor force goes. Anyone who believes in nominal wage rigidities for behavioral reasons (and, seriously, why wouldn’t you) should accept this as a natural extension of that irrationality. Firms that want to expand employment don’t have perfect information about the quality of potential workers. There’s the chance they may be way better than expected, in which case raising relevant wages to keep the worker is quite easy. But what if they’re not as productive as the firm wished? Heaps of empirical evidence shows that firms just don’t like cutting nominal wages. 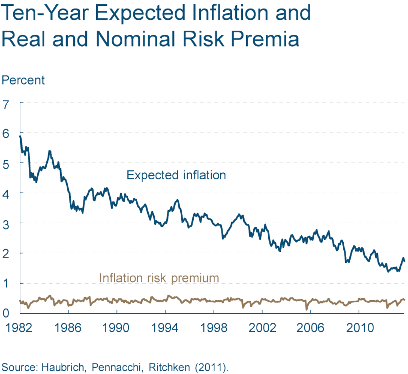 Inflation, then, is an insurance policy against imperfect information. Conversely, a firm that is downsizing because of changing (microeconomic) demand can choose to inflate away a workers’ wage rather than laying off employees en masse. This is more relevant to the poor and casually employed where large-scale employers face more informational uncertainty. These two effects – both derivative of higher inflation – are self-reinforcing. As the chance of being hired increases, the stock of free labor will fall increasing real wages further. As these together increase aggregate supply and aggregate demand at the same time, real wages will increase without a substantial increase in the price level (above that which is dictated by a expansionary central bank). This encourages more entry into the labor force, and the process fulfills itself until a wage-price spiral forces the central bank to increase interest rates. And farewell to the liquidity trap. In the short run – and only in the short run – there is a risk of overshooting. That is, in the period where all savers adjust to a higher inflation rate, those who left the labor force for life cycle reasons may feel compelled to return as their savings are eroded. However this is, to a large extent, stemmed because most seniors at risk rely primarily on Social Security, which is inflation protected. More importantly this – like anything else – requires a judgement call on behalf of policymakers about the composition of labor force exit – between retirees and discouraged workers. It would be smart to use the employment to working population rate, rather than U3 unemployment, as a key indicator of labor market health. That said, we emphasize that the benefit of this action is linked to the assumption that NAIRU is within the FOMC’s central tendency. Our own view is that NAIRU is higher, which would imply higher potential inflationary costs from lowering the unemployment threshold and a worse cost-benefit trade-off. San Francisco Fed President Williams has made similar arguments, saying that uncertainty around any NAIRU estimate is high and that policymakers may be better served by keeping the 6.5% threshold in place and conducting policy in a more discretionary manner once the threshold has been reached. Other center-leaning FOMC participants may also share this view and we read staff conclusions in this regard as providing justification for a lower unemployment rate threshold, but that view need not be binding on policymakers. That’s curious, because it seems like they cite NAIRU either without realizing what it is and what it means, or without realizing that the Evans Rule has a clause for inflation and is constructed disjunctively. If the unemployment rate falls below the NAIRU, and inflation doesn’t pick up, THEN IT’S NOT THE NAIRU. If unemployment falls below the NAIRU, and inflation does pick up, the Fed has every right to increase the interest rate given the Evans Rule without compromising credibility. If the Fed believes in any natural rate of unemployment – and, clearly, it does – the dual threshold of unemployment and inflation is completely tautological, as one implies the other. This presumes that the theory behind NAIRU holds. And if it doesn’t, having an unemployment threshold is completely useless because what the Fed really wants – for any given inflation rate – is maximum employment. Consider the uncertainty the unemployment threshold creates in financial markets. For one, it adds one more variable to be monitored whose interpretation by the central bank must be monitored. But there’s already so much talk that this threshold will be lowered that markets have no idea how to read the Fed’s reaction function. If the NAIRU is 0% and the Fed increases rates before we get there, then policy will be unnecessarily contractionary. If the NAIRU is 15% then by definition the Evans Rule will require an increase in rates until inflation falls to the target. All we know for certain is that inflation is well below target today, and so monetary policy is insufficiently aggressive. Just an obvious point that I’m not sure enough people have been making: Mario Draghi’s surprise rate cut is, in effect, a repudiation of the nascent triumphalism of Europe’s austerians. Those who follow these things probably noticed that just a few weeks ago the austerians — Olli Rehn in particular, but many others too — were hailing signs of a bit of economic growth this quarter as vindication of their policies for the past four years. Yes, it was silly — I mean, I could keep hitting myself in the head, then slow the pace of the punishment,and I would start to feel better. Does this mean that hitting myself in the head was good for me? Still, there it was. But then the ECB took a look at more relevant indicators:unemployment still rising, core inflation dropping below 1 percent (Japan here we come). And it seems to have gotten very worried. Put it this way: the ECB wouldn’t be slashing rates if it thought Europe had turned the corner. There are many fantastic reasons why Eurozone austerity was useless, this just isn’t one. The fact that the ECB could cut rates – that is, stimulate the economy – suggests that monetary policy was not neutered by a liquidity trap (though now it is) and hence austerity would not have been as harmful had Jens Weidmann actually understood a thing or two about economics. Of course, if the natural interest rate is negative a rate cut won’t be enough, but it certainly doesn’t increase the case for austerity. This is what Scott Sumner would call monetary offset. (Which is too strong a concept for me at the zero lower bound, but perfectly sensible for the jokers at the ECB – until now). By the way, one of the best arguments against austerity is distributional, at least in the United States where middle class taxes are relatively low.